Want to run a race with WRC? Here’s how. Here’s a message from WRC’s racing coordinator, Ms. Julia Taylor! We’re almost half way through 2015, so I thought it would be a good time to remind everyone of some of the upcoming races that have team competitions. If you’re interested in running for WRC in any of these events, please contact Julia Taylor at jtrunningdc@gmail.com. We don’t know these people, but it’s a great photo for the upcoming holiday! WRC will be meeting on Sunday, June 21 for our weekly Distance Run. The run starts at 7:00 a.m., leaving a lot of time to celebrate Father’s Day! We’ll be meeting in front of the CB2 Store on M Street in Georgetown. Pace groups include 7:30 min/mile, 8:00/8:30 min/mile, and 10:30 min/mile. Almost all of our runs are out and back, so everyone is invited to join and run the distance you need! And, by popular request, we’ll be meeting at Dog Tag Bakery after the run for conversation, coffee, and carbs. 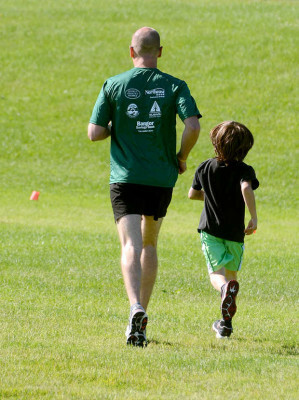 Washington Running Club has not one, but TWO days of running planned for this weekend! 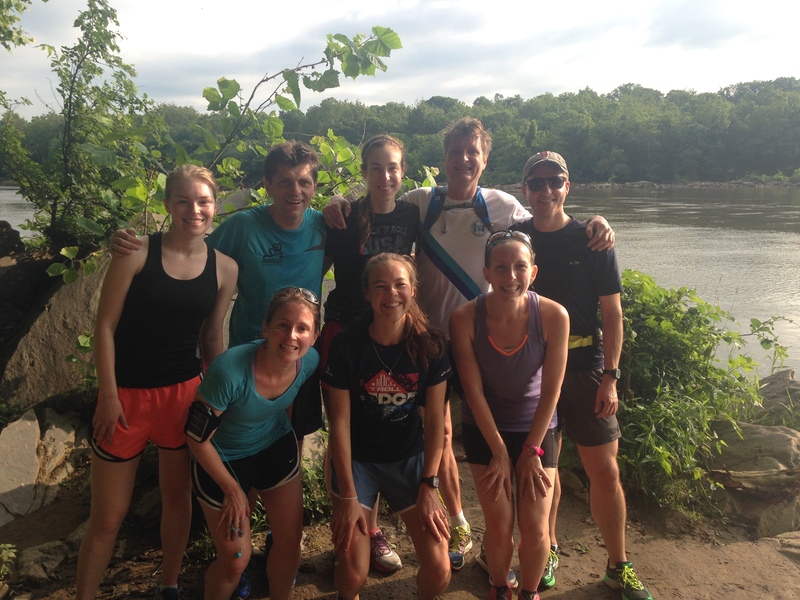 First, on Saturday, June 13, we’ll join local track group, the Cardozo Crawlers, for a trail run + original U.S. Capitol ruins exploration in Rock Creek Park. It’s also an SDR, but this time it’s the Saturday Distance Run. Click here for more information on exact location, times, etc. 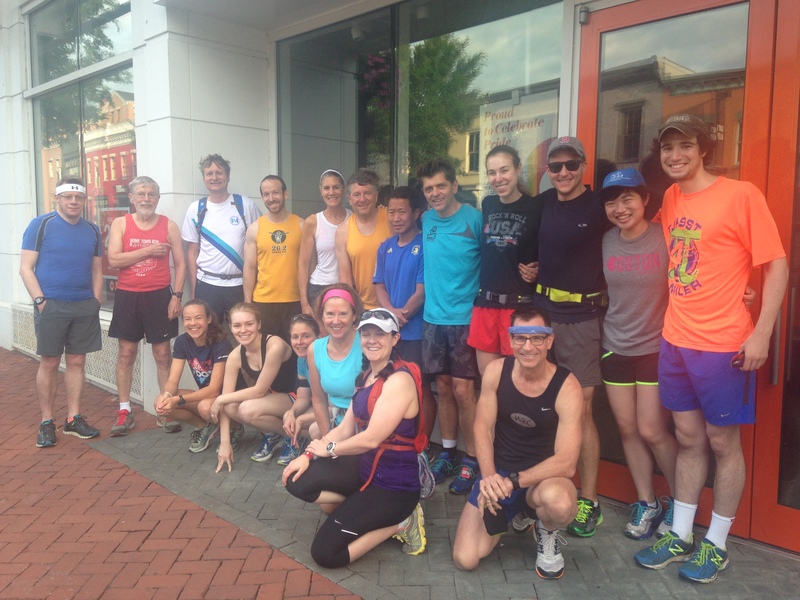 Then, on Sunday, June 14, we’re back to our regularly scheduled run, meeting at 7:00 a.m. in front of the CB2 Store on M Street NW in Georgetown. We have three pace groups – 7:30 min/mile, 8:30 min/mile, and 10:30 min/mile and will be running anywhere from 5-15ish miles (depending on who’s training for what). Coffee n’ carbs will follow! If you have any questions about either run, feel free to email me at lauren@washrun.org. Local track group Cardozo Crawlers will be hosting an 8 mile trail run in Rock Creek Park, starting at Picnic Area #6 (map below) and heading up the Valley Trail to the Western Ridge. Let us know if you have any questions! Hope to see you there! When: Saturday, June 13 at 7:00 a.m.
WRC taking in the beauty of the Potomac Heritage Trail. 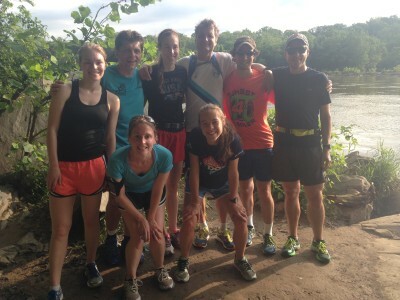 On Sunday, June 7, a group of WRC runners ventured onto the Potomac Heritage Trail for a 10-ish mile run. It was a first for everyone – truly unmarked territory, another trail to check off the list of must-do runs in DC. Except this isn’t like many of the other runs in the area. The Potomac Heritage Trail, which starts just under the ramp to Roosevelt Island, is less than a mile from WRC HQ at 33rd and M Street in Georgetown. Within a few minutes, you feel like you’re a world away. You’re running at literally river-level, crossing bridges, jumping over rocks to cross streams, and slowing your run down to a climb to conquer boulder-laden trails complete with almost vertical climbs. WRC took the Roosevelt Island to Chain Bridge challenge, which is commonly known as the first segment of the trail. The majority of the trail was runnable with the occasional steam crossing. However, it quickly turned to a full body workout, complete with rock scrambles and even vertical climbs. Rumor has it that the trail becomes more runnable, and even more beautiful, after the Chain Bridge, but since many folks are ramping up their fall marathon training, we crossed the Chain Bridge onto the C&O Canal and headed back to Georgetown. It’s fair say that after the challenging terrain leading up to the Chain Bridge, the flat, non-technical Canal was a welcome sight. All in all, the Potomac Heritage Trail proved to be a fun adventure and a welcome change for WRC. The terrain allowed for a slower, conversational pace, allowing us to chat and get to know visiting runners Simon and Carel from the UK. However, it will probably be saved for down-time from our regular training cycles since a consistent pace just isn’t possible. We may even look into additional routes to avoid the rock scramble leading up to the Chain Bridge. Can you spot the difference from the first photo? The bottom line? 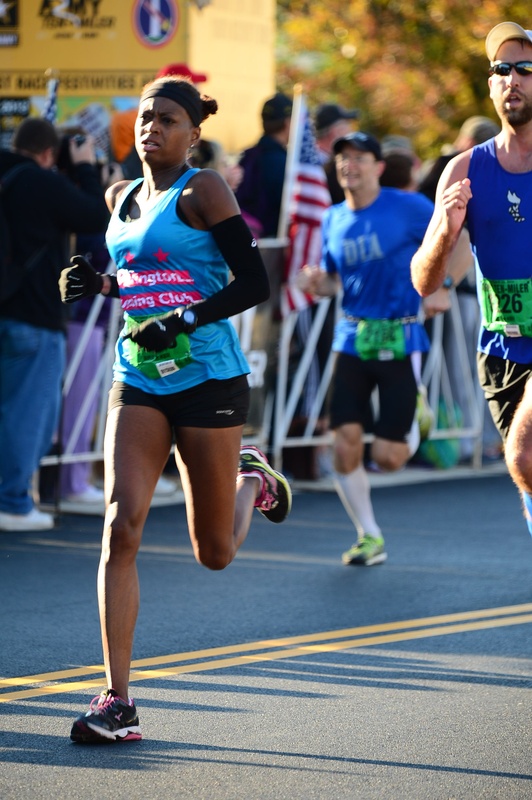 Take the Potomac Heritage Trail challenge when you need a break from your normal running routes, pounding the pavement, or city life (or all of the above). It promises peace and quiet, beautiful views, and a unique experience just steps outside of the bustling city life. Save it for the days when you just want to run without the stress of pace or distance, the days when you want to remember why you started running in the first place. Nineteen runners joined the Washington Running Club this morning for their Sunday Distance Runs. Many stuck to our regular routes, while a contingent ventured onto the Potomac Heritage Trail for a slightly-technical technical trail run – more on that later! Either way, we had some solid runs to kick off the month of June! It’s a fine Sunday morning with WRC! Ben Stutts (left) with Kirk Masterson after winning pies at a race last year! 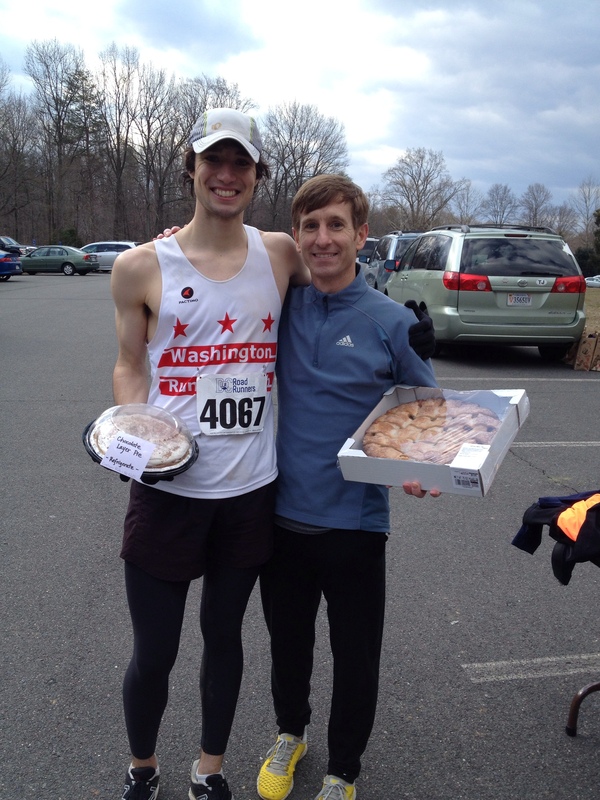 Ben Stutts and I have been talking about running on the Potomac Heritage Trail since WRC’s annual party back in January. We said we’d wait until the snow melted. Well, we’re keeping our promise to run the trail – and just in time, as Ben is leaving DC to get his Ph.D. at Southern Methodist University! If you’re up for it, join us for a run on the Potomac Heritage Trail. We’ll start at 7:00 a.m. from our normal place (in front of CB2 in Georgetown) and head across the Key Bridge and onto the trail. From there, we’ll run the trail to the Chain Bridge, maybe a pinch further, before turning back. Mileage should be between 10-12, but the run is technical so it will take longer than usual. Check out a great description of the trail on Rock Creek Runner. But what if I don’t like trail running? That’s fine! We’ll still have a group running on our normal routes at varying paces/distances, and will also start at 7:00 a.m. in front of CB2 in Georgetown. Dean & Deluca will follow!